From the English, we know that different fittings can make an extraordinary piece of jewelry into a practical object. Consider multiple functions for a set of diamond brooches. 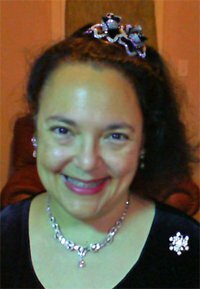 I have always felt you can take a brooch to a jeweler and ask him or her to make a barrette fitting in addition to the pinback. This simple act increases your choice of ornaments 100-fold. 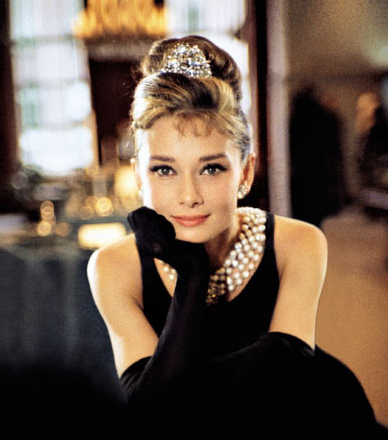 Movie stars have made fashion history doing this. 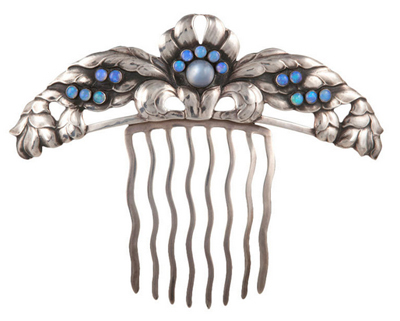 Here are some brooches I would wear in my hair. J.E. Caldwell was an American jeweler from Philadelphia. 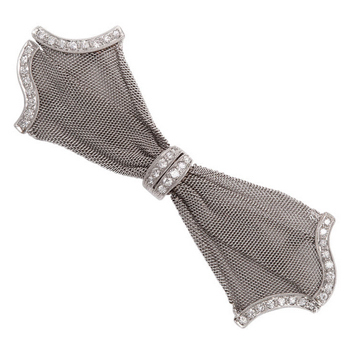 He was known for his Art Nouveau and Art Deco pieces and made this platinum-mesh and diamond bow c. 1920. 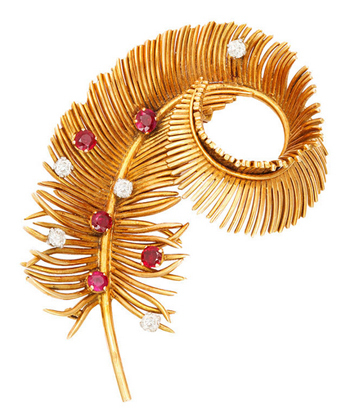 Boucheron made this feather out of gold, rubies, and diamonds in 1940. 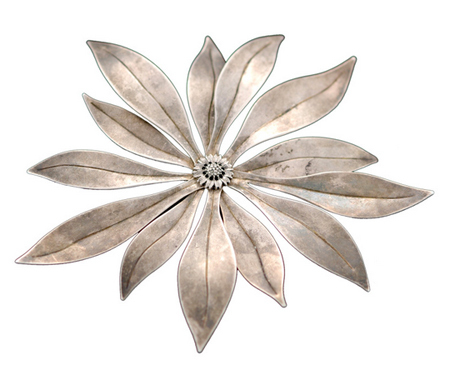 A member of the elite jewelers of Taxco, Antonio Pineda made this brooch c. 1955. Born in the tenements of NYC’s Lower East Side to immigrant parents, he took the name Seaman because he could see the Seaman’s Savings Bank from his apartment window. From the 1930’s to the 1950’s, Mr. Schepps’s pioneering designs attracted customers such as the Duchess of Windsor and Franklin Roosevelt. 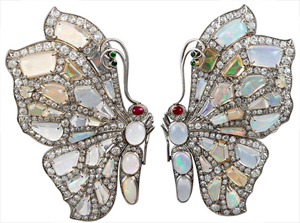 He designed this set of opal and diamond butterfly pins, which could easily be worn as two side barrettes, c. 1960. David Webb made this posy of violets in the 1980’s. 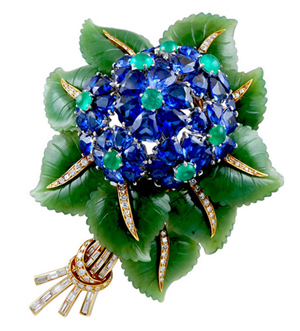 The violets are sapphires with emerald centers on jade leaves with diamond stems. 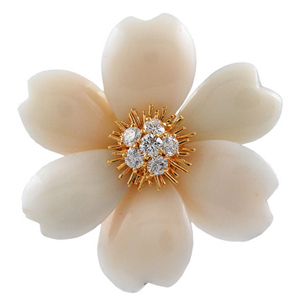 Van Cleef & Arpels made this Christmas rose out of angel-skin coral and diamonds in 2000. 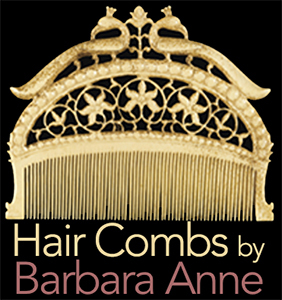 Finally, a hair comb by Georg Jensen himself.